Why Donate or Join MCCE? As a member, you will be supporting programs that actively engage youth so they become active, knowledgeable citizens. MCCE advocates for high quality law-related and civic education for all schools k-12. Join us to add your voice to our advocacy efforts. MCCE is part of a national network of Law-Related and Civic Education Centers throughout the United States. Members receive updates on new resources, professional development, research, best practices and training opportunities. As a Member, you will receive a 10% discount on MCCE publications and programs, and priority over non-members in registration for Center events. 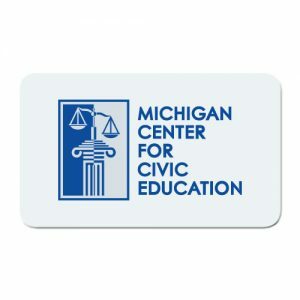 Click on the membership or cart button below in order to join today & support civic education in Michigan!